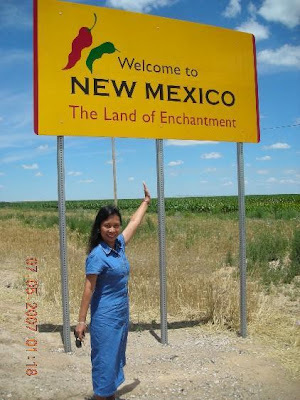 I love taking pictures infront of the welcome signs of the states that we visited. I got this idea from my friend Sofia. I think this is a good idea to take souvenir shots of the states that we've been to. That's the reason that I prefer to travel by car rather than by airplane because I get to see other states that we passed by. I just got here in the US when we drove to Iowa and we passed by a few states like Oklahoma, Kansas and Missouri. We didn't stop to take photos in the welcome signs. I didn't have this idea yet of taking photos in front of the welcome signs. But it's good we took the photos of the welcome signs of the states we passed by when we went to Colorado last summer. 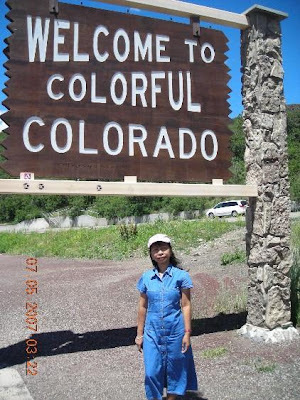 Also I had my photo taken in front of the welcome sign when we went to Oklahoma. I love sight-seeing and taking pictures. I enjoy looking at the wonderful creations of our Lord. It's awesome! Makes me love Him more and more. wow.. ang sweet nyo naman mag asawa. those are cool pictures Lisa. That is really great to take pictures of places that you went to with your hubby, its very memorable. anyhow.. i got a tag for you. its in this LINK c ya around!